I’m a nutritionist. My main focus is on food. But sometimes food alone is not enough to obtain some sort of equilibrium when cortisol levels are severely unbalanced. Disclaimer…. I am not a naturopath or medical doctor and therefore do not have the right to diagnose anyone with an ailment. I cannot order tests, I can only recommend. What I can do is help you once you have been diagnosed with an imbalance. If you’re exhibiting symptoms that are consistent with unfavourable levels, I can recommend that you try certain vitamins or herbs. I encourage you to check with your naturopath or medical doctor to get your levels checked. If you have a pre-existing condition (diabetes, heart condition, auto-immune disease, etc. ), if you’re on any medications or if you are pregnant or planning on becoming pregnant, please check with your naturopath or pharmacist for any possible interactions. 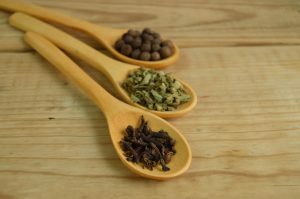 Vitamins rarely cause any problems, especially at these levels, but herbs can pose a bit trickier. Please keep in mind that all supplements are not created equal. The majority of options at your local grocery or department store are not great. The challenges are the additives which do nothing for you, can cause adverse reactions in people with food allergies or sensitivities, and their absorption rate is very low, which basically means you’re paying for expensive pee. Even your local health food stores will have supplementation of varying levels of purity and effectiveness. The store staff will be able to help you with the specific brands. Not everyone responds the same to every product because we are all biochemically and energetically different. I’ll be honest, sometimes it’s a trial and error thing. But I can certainly help you and your naturopath may have access to even stronger nutraceuticals than I do. Having said all that, according to my research, the following may be helpful. For high cortisol (for the possible symptoms please refer to the post entitled “What Happens When Good Cortisol Goes Bad“) or feel free to contact me here. Vitamin B5 (pantethine) appears to reduce the hypersecretion of cortisol when under high stress. If you’re under prolonged stress, take 500 mg/day. Since Vitamin B5 is water soluble, any excess will be excreted in your urine. Vitamin C, another water soluble vitamin has been shown to lower cortisol levels and is another safe vitamin to use. Recommended dosage is 1,000 mg three times per day. If you notice you’ve developed loose stools, although not likely at this level, lower your dose to perhaps 1,000 mg twice per day. Phosphatidylserine (PS) …. Yes, I know it’s a mouthful … I still can’t pronounce it properly J. This supplement is an extract from the membrane of a cell, and has been shown to reduce cortisol levels when taken in pill form. Optimal dose appears to be 400 to 800 mg/day. PS has been shown to buffer stress-related rises in cortisol and improves mood under stress. It even improves memory!!! Fish oil has been shown to lower cortisol levels due to mental stress along with lowering blood pressure. It’s important to choose a form of fish oil that has been third-party tested and free of mercury and other endocrine disruptors. 4 grams of fish oil per day has been shown to reduce morning cortisol levels (very important) and increase lean body mass. L-tyrosine is an amino acid that serves as a precursor to the neurotransmitters norepinephrine and dopamine which can be depleted by stress. Just don’t take it right before bed as this can interfere with sleep. Asian ginseng helps regulate high cortisol levels, reduce fatigue and stress and improves immune function. It has also been shown to help lower blood sugar, improve cognition, working memory and calmness. Korean red ginseng helps women with symptoms of menopause such as fatigue, insomnia, depression and anxiety. It has also been used as a sexual tonic. Ashwagandha may help reduce anxiety and buffers effects of high stress. Ashwagandha is less sedating than other ginsengs which is excellent for women with anxiety and/or sleep issues. Fortunately Ashwagandha is safely used with antidepressants, but please check with your pharmacist. Relora is an herbal combination that may reduce evening cortisol and stress-related eating, but only in overweight and obese women. Relora may also reduce anxiety in premenopausal women. Rhodiola is used to enhance physical and mental performance, stimulate the nervous system, fight depression and improve sleep. It seems to alter levels of dopamine, norepinephrine and serotonin in the brain. It has also shown to improve mental performance and concentration and decrease cortisol levels. Please keep in mind that I do not recommend all of the above together, although some of the herbs do come in combinations which work synergistically. “Well that’s great Sandy, but my cortisol level is tanked. Any suggestions?” As a matter of fact, yes there are a couple of options for you. Vitamin B complex (50 mg twice a day) together with 1,000 mg Vitamin C three times per day helps to restore cortisol production and diurnal rhythm (sleep/wake cycle). Licorice (Glycyrrhiza) … and no, I’m not talking about the red chewy candy although it is kinda yummy … helps raise cortisol production. Major cautions here. If you are pregnant or planning to become pregnant soon, I would recommend you skip the licorice. Also, if you have high blood pressure, skip the licorice or if it’s not too high, consider deglycyrrhizinated licorice. Just try a bit, keep an eye on your blood pressure and you can try a bit more. But please check with your pharmacist. Grapefruit juice has been shown in some cases to raise serum cortisol so the same cautions should be applied to licorice as well. So there you have it. Generally speaking, there is a higher chance your cortisol will be high if you notice symptoms. It usually will become low after you’ve been in hyper mode and depleted your body’s ability to manufacture cortisol. It is very important to get control of your cortisol levels before they become depleted and you exhibit signs of depression and lose your energy and joy. Stay tuned for next week’s post when I review lifestyle changes that you can make and introduce you to my favourite self-`care advocate, Celia.